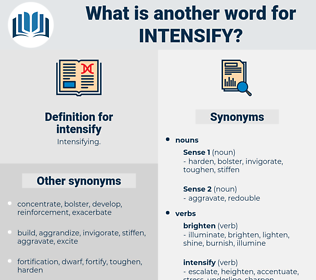 What is another word for intensify? twisted the knife in wound. 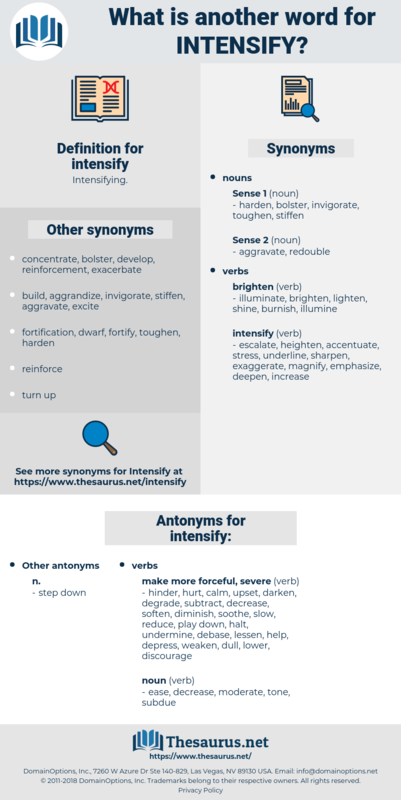 intensified, intensifying, intensification, intensifies, redouble. further, redoubled, enhance, stepped-up, Heightened. heighten, exacerbate, aggravate, augment, sharpen, worsen, solidify, accentuate, fortify, reinvigorate, toughen, invigorate, broaden, further, widen, inflame, renew, develop, extend, enlarge, deteriorate, upgrade, enhance, grow, raise, step, stimulate, entrench, double, buttress. hinder, hurt, calm, upset, darken, degrade, subtract, decrease, soften, diminish, soothe, slow, reduce, play down, halt, undermine, debase, lessen, help, depress, weaken, dull, lower, discourage. The effect of her death has been to intensify that reserve to which I have already alluded. Be it granted, also, that sometimes a new movement will intensify an old habit.